Mon - Fri8 a.m. - 4:15 p.m.
Office Hours: 8:00 a.m. to 4:15 p.m.
We aim to inspire and empower our students for success in all aspects of life. 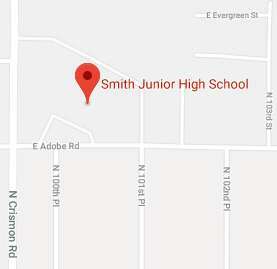 The mission of George N. Smith Junior High is to support the successful educational process of each student in a safe and orderly environment. Our staff collaborates to provide opportunities for all students to become college and career ready by developing appropriate interpersonal skills, supporting a positive school culture, and becoming lifelong learners contributing to their communities.